This past year, I have been working on purging and living a more minimal life. A lot of the time, people hang on to things simply because they haven't realized they don't even use that item anymore. I remember reading about cleaning out your closet years ago and one line always stuck with me. If you haven't worn it in a year, get rid of it! 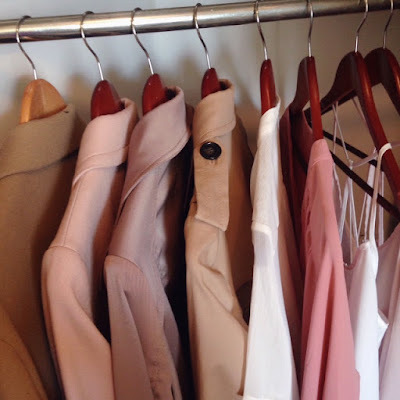 Take a couple of hours this weekend to look through your closet, get in touch again with what you have in there and really take them time to think about each piece. Is it still useful to you? Have you worn it in the past few months? Is the fit right for you? I know that I've been guilty of keeping pants that are too long for me or shirts that don't quite sit properly, just because I like how they look - just not particularly how they look on me! In the Fall, I did a major overhaul and took everything out of my closet. If this stresses you out, I've put some tips together for you. Not only can it be productive, but it can be also be healthy and (believe it not) fun. Okay, now that you have no more excuses, read through these and begin setting a weekend this month to give your closet a makeover! 1. PULL (or Dump) Begin with one side of your closet, pull out items, one by one. I do it this way but feel free to dump everything on the bed and start from scratch...this may also help you note how much you really have stuffed in there. 2. TRY IT ON: Unless they are an everyday article that you know fit you perfectly and has become like your second skin, try the items on! Yep, everything! Look in the mirror and think, does it fit well? Do I still wear this? Do I feel good in this? Does it need to be tailored? Does it need to go to the dry cleaners? Will I ever wear this again? 3. BE HONEST: This is the time to be brutally honest with yourself when you try to answer these questions. If you can't decide on an item, get rid of it. Remember, your closet is hot real estate! I remember thinking sometimes while I was doing this, I can't part with this, I never wear this but... And then I decided to let it go, I felt so much better and lighter. Ask me if I can even remember what those items were!! Fight the urge to hoard. 4. FRIENDS: Pull a Carrie Bradshaw and invite your friends to help you out! Music, snacks and friends make this process so much better - just make sure you still get the job done! When you are debating, trying to convince yourself that you'll eventually wear that dress you bought two years ago even though its still hanging in the closet with the tags on, friends will come through and give you the reality check you need. Another great thing about inviting your friends is that you can recycle items. Maybe it's hard to part with a particular sweater but knowing your friend can use it, will make you feel glad someone is getting great use of it instead of it just hanging on a hanger! A couple of years ago, my sister-in-law had a bunch of us over and it was a clothes swapping party. We all brought clothing and accessories we no longer used and swapped! 5. PILE: Make three piles: Keep, Toss, Donate. Toss the articles of clothing that are no longer wearable. Do they have rips? Stains? Those you toss. For gently worn articles, make sure to give them a second life by donating them to a worthy cause! There are charities that will even come to your front door to pick your donations up! I mean, come on, how amazing is that?! I always call The Diabetes Association, Clothesline. You just call them and schedule a pick up. If you aren't home, you can just leave the boxes or bags labeled outside and they'll swing by and get it. I have linked the info here. It doesn't get any easier than that! 6. 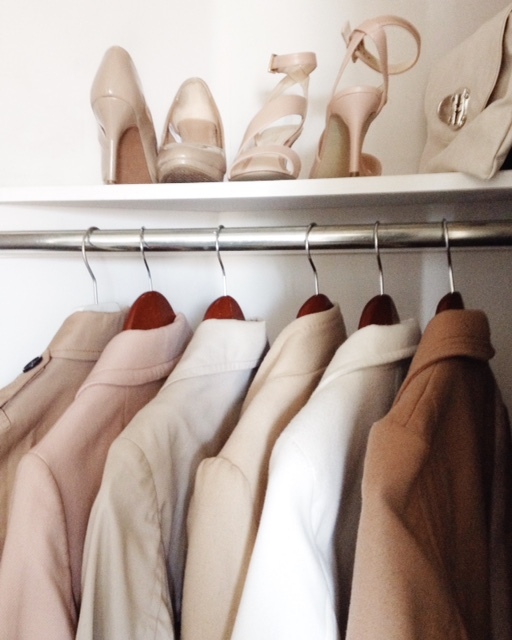 RE-ORGANIZING: Once you have figured out what you are keeping, you can begin putting your closet back together again. This is a great time to re-organize things. See how much room you have now?! 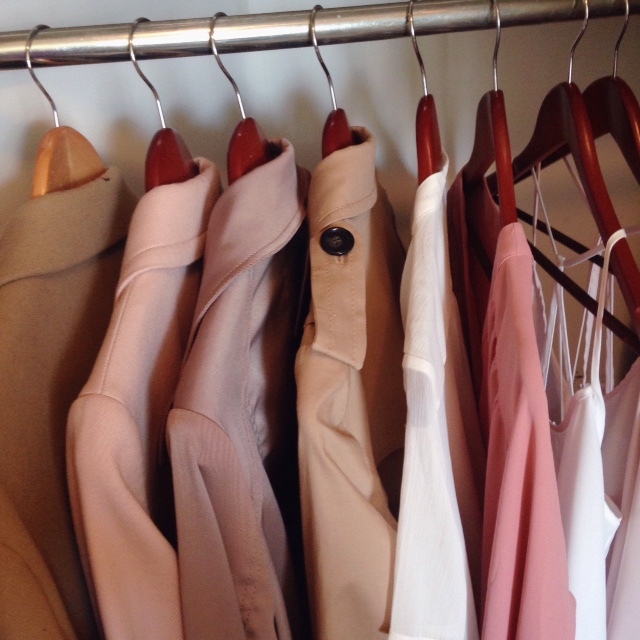 I always organize my closet by categories: coats, pants, dresses, shirts, etc. That way, in the morning, it's easier to pull an outfit as I know where everything is. Pick a system that works for you and stick to it. And you're done! You'll soon realize that you even begin shopping with a different mindset. Because you took the time to really look into your closet and reflect on what you had, you begin to have a better understanding of your actual needs and wants. Here's to a lighter 2017!